It’s that time of the month again, when my InBox receives reminders of two parties close to my heart. 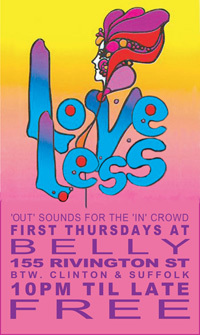 If it’s the first Thursday of the month, it must be LOVELESS, every New Yorker’s top pysch-out shoe-gaze space-rock gathering, albeit at a bar with crap sound. And if it’s the first Friday of the month well, it’s no longer STEP ON, but RESURRECTION continues the Madchester flavor at The Royale on 5th Avenue in Brooklyn this Friday November 4 with its founder’s full blessing. In fact, now seems a good time to announce that I’ll be returning to the scene of past crimes and DJing there myself next month, Friday December 2nd. As I already told Nick and Matt, who’ve taken over from Posie and myself, I fully intend to drink liberally, play ‘Fool’s Gold’ three times in an evening, drunk dial one of them at 6 in the morning and complain about the pay. Just joking boys… Along the way, I promise to play good music. So do they, every month. RESURRECTION is at The Royale, 506 5th Avenue (‘tween 12th-13th Streets), Park Slope, Brooklyn, Friday November 4, from 10pm onwards. Free admission for over 21s.